Crockpot Weight Watchers Recipes: Weight Watchers Slow Cooker Potato and Bacon Chowder Recipe-3pts. 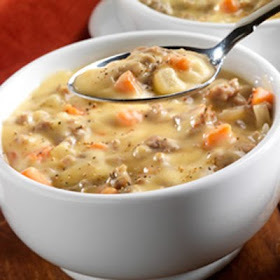 Weight Watchers Slow Cooker Potato and Bacon Chowder Recipe-3pts. This fabulously yummy Canadian Bacon and Potato Chowder Slow Cooker Recipe is a perfect addition to any Weight Watcher Meal Plan. With just 3 Points per serving and tons of fiber and protein, it’s very filling, so you won’t be so hungry a few hours later. What you can do with these crock pot recipes is separate out the individual portions and freeze them, that way, when you need a meal really fast and are too busy to make anything, you can easily reheat one of these servings for a quick and tasty meal. This particular dish tastes really good reheated because the flavor of the bacon just oozes into the creamy broth…mmmmm!! This Potato and Bacon Stew Recipe is really so delicious that the whole family will love it — and they’ll have no idea it’s a Weight Watchers Recipe! Enjoy. Stir in evaporated milk and half-and-half; heat through, uncovered, about 10 minutes.